Bogor Agricultural University (IPB) signed a Memorandum of Understanding (MoU) with the Government of Sinjai District, South Sulawesi Province. This partnership was done as an effort to strengthen knowledge and technology by empowering the existing potential of resources. The said resources were education, research, and community service. The MoU signing was conducted on Thursday (17/11) in Ruang Sidang Rektor, IPB Dramaga Campus, Bogor. It was done by IPB Rector, Dr. Arif Satria and the Regent of Sinjai, Andi Seto Gadhista Asapa. Also present in the event were the Vice Rector for Collaboration and Information System, Prof. Dr. Ir. Dodik Ridho Nurrochmat, M.Sc.F., Vice Head for Community Development of The Institute Of Research And Community Empowerment (LPPM IPB), Prof.Dr. Sugeng Heri Suseno, S.Pi., M.Si, Dean of the Faculty of Economics and Management, Dr. Ir. R. Nunung Nuryartono, M.Si, lecturers of IPB, and staff of Sinjai Regency Government. IPB Rector, Dr. Arif Satria said that IPB welcomed warmly the partnership with Sinjai Regency. According to him, IPB as a university has a moral responsibility to help to support the development in Sinjai Regency. Through this, IPB is committed to developing a partnership in education, agriculture, fishery, animal husbandry, and community empowerment. This partnership is managed centrally by LPPM through IPB Goes to Field (IGTF) program, Thematic Concrete Work Course (KKN-T), and Agrocreative Field Station (SLAK). “IPB is also developing the Animal Husbandry School or Sekolah Peternakan Rakyat (SPR) all over Indonesia. This partnership is done in the field of increasing the capacity of farmers, utilizing science and technology, and implementing collective business,” said IPB Rector. Rector added that this SPR program could be a research-based learning and counseling center. The principle of social capital can always be continued and become the solution for the problems of natural resources, intergroup relationship, and the relation between the stockbreeders and investors. Dr. Arif Satria also emphasized that the Government of Sinjai Regency could send its best students to study in IPB through the Regional Delegation Scholarship (BUD) channel. The channel is one of IPB’s ways to produce excellent human resources in facing the future’s challenges. It is expected that all graduates from BUD channel can go home to their respective region, develop their hometowns, and advance Sinjai Regency with all the knowledge they get from IPB. Meanwhile, Sinjai Regent, Andi Seto Gadhista Asapa conveyed that this partnership had to be executed concretely. 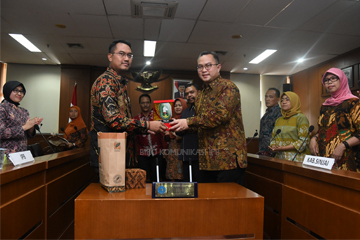 He said IPB could send its lecturers and students to help to develop the potentials in Sinjai Regency, especially in the field of agriculture, fisheries, animal husbandry, plantations, and human resources. Andi emphasized that Sinjai Regency is ready to accept students and lecturers through KKN-T and IGTF programs. "We want Sinjai Regency to become a center for cattle farming and we hope that IPB becomes a university that can help make it happen with the SPR concept. We consider the SPR concept to be very successful and provide benefits to farmers, especially regarding good cattle husbandry,” he said. He believed that SPR program is very focused on transferring knowledge so that farmers will have more knowledge in cattle husbandry. He hoped that this partnership can be realized as soon as possible to get Sinjai Regency to produce good quality of cow that is ready to be marketed. He added, regarding BUD channel, the Government of Sinjai Regency is very glad and will send its best students to study in IPB. Hopefully, after graduating from IPB, the graduates will develop the government of Sinjai Regency in agriculture well.